I know this isn’t a knew idea by any stretch, but it’s so fabulous and babies just absolutely love it. 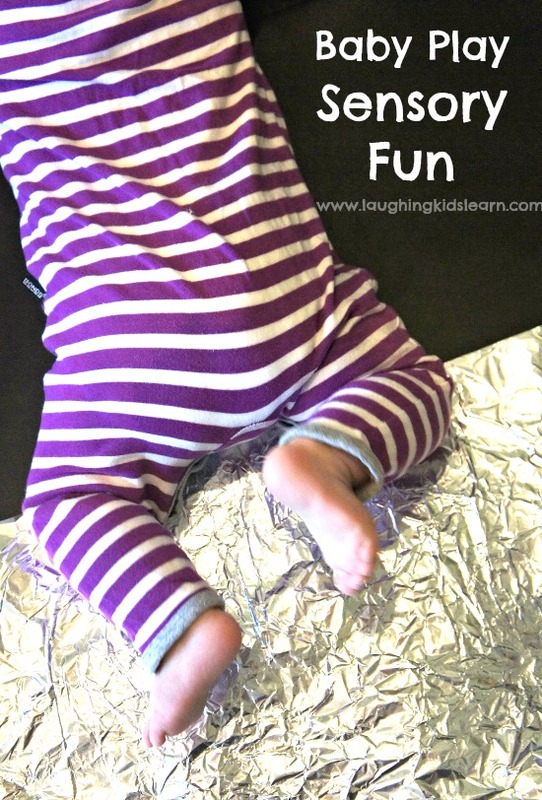 So here is a fun sensory baby play activity using a muffin tin. 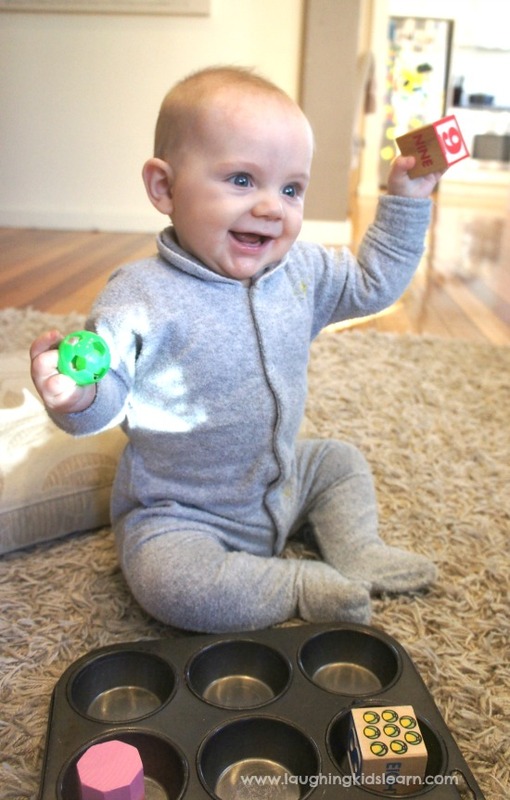 It is so easy to set up and will have your baby playing and exploring for a long time. Of course this activity can be modified to suit your own baby and their skills. 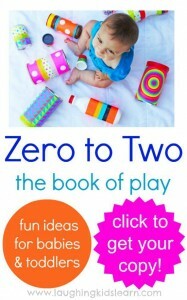 Boo (8 months) is growing so fast that I’m pumping out these baby play ideas at a rate of knots. I hope you’re enjoying them as much as I am sharing them with you. Of course you might remember me doing this activity with Possum (now 3.5 years) when she was a similar age. 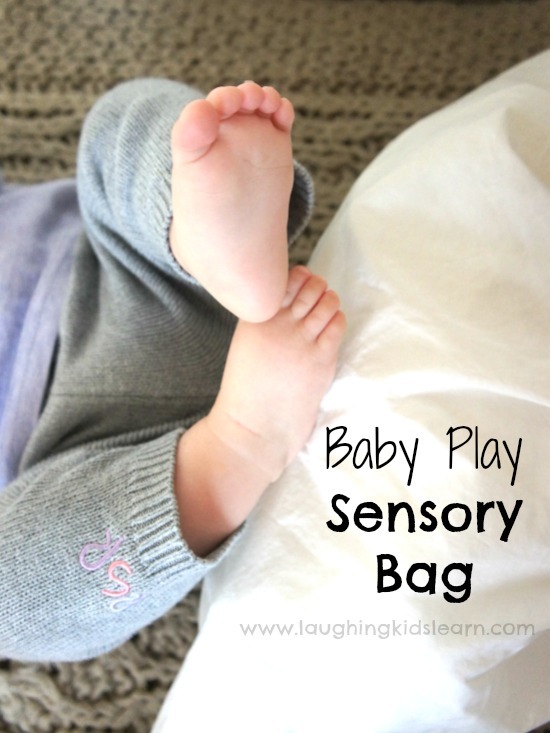 It’s such a great way to engage your baby in play and exploring objects and textures. 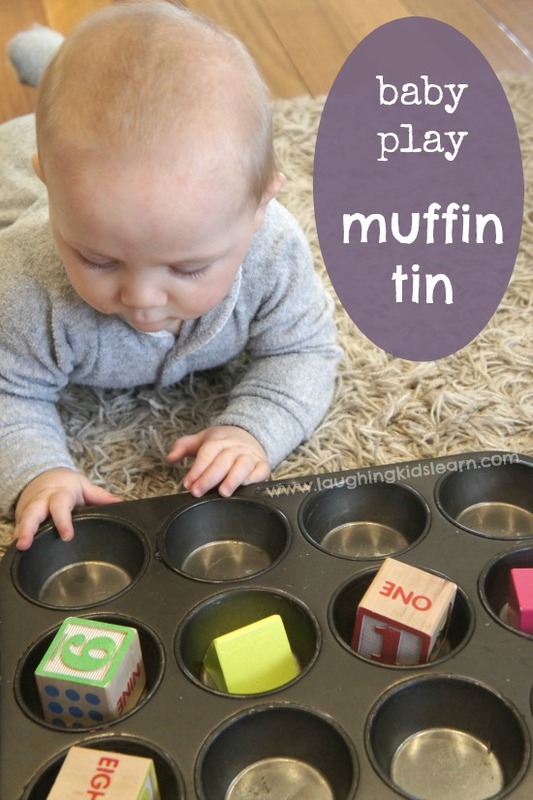 To set this activity up all you need is a baking muffin tin (or similar) and a variety of safe objects for your baby to explore. Of course children love to put objects into their mouths so ensure what you are offering them has nothing that will break away or cause them any harm. Lets keep play safe. 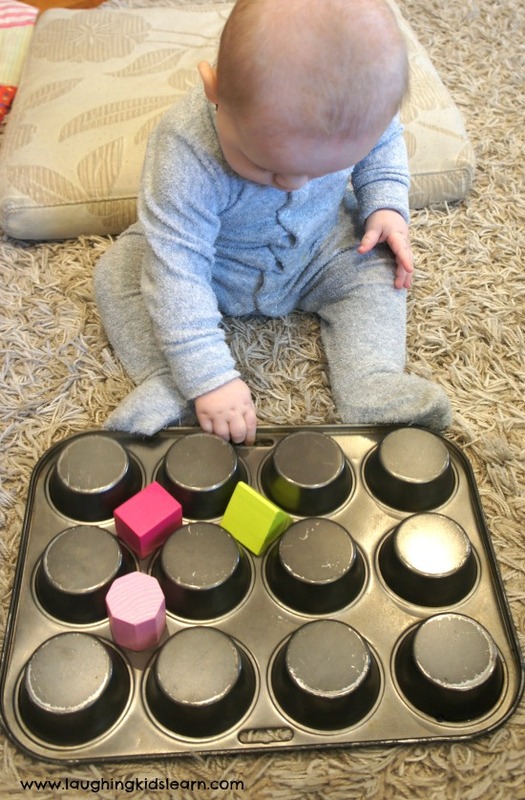 Of a 12 piece muffin tin I added about 7 or 8 safe objects for her to explore. It’s a good idea to leave a few empty muffin ‘spaces’ as it will give your baby room to transfer objects from space to space. It’s wonderful to see them do this. The objects I used varied. I found some interesting balls at the discount store. 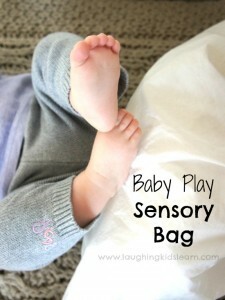 They were great textures and had interesting colours and bells inside of them for extra sensory development. 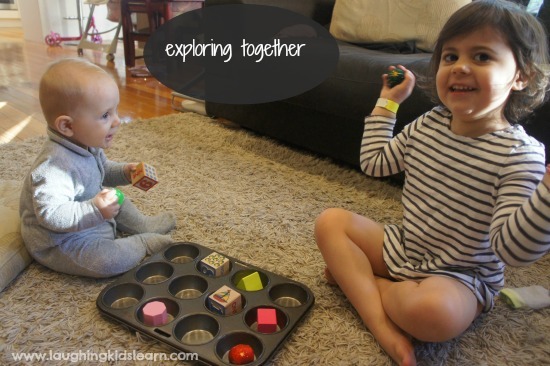 They were safe enough for supervised play and perfect for this activity. 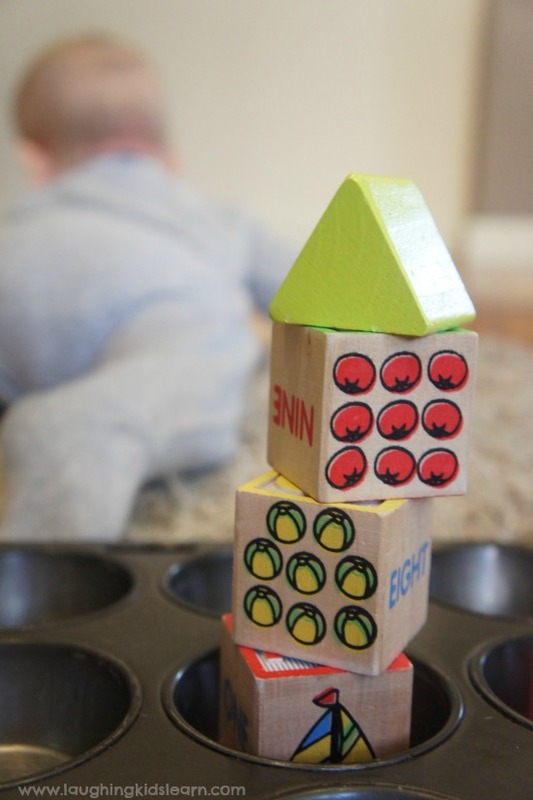 I also had some lovely wooden blocks of different shapes. Sometimes I think we can fall into the trap of giving our children amazing sensory experiences, but only make them use their hands! It’s a shame because children learn SO much for using their feet. It is for this reason that I am always conscious to turn around activities, as you see above. During this picture Boo was conscious that the tin was at her feet and worked extra hard to move her lower body and shift it with her feet. How awesome is that! Great for developing body awareness, problem solving and gross muscle strength. If you find yourself using blocks you might like to build small towers for them to swipe and knock over. This would be great for children who had the strength in their upper body and were able to hold weight on one arm or on their chest. 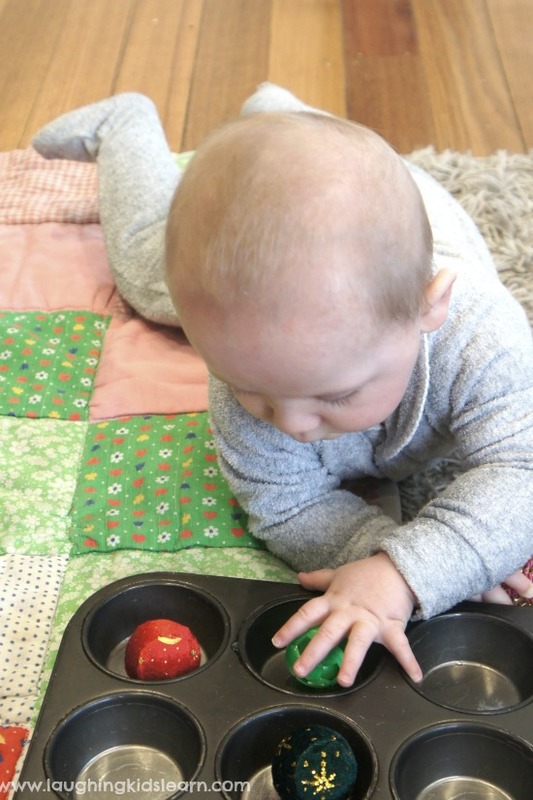 As you can see this sensory baby play activity using a muffin tin is fabulous for encouraging tummy time! Boo is learning to sit up herself and so if your child is able to do so, try this activity with them in the seated position. I placed a pillow behind her, in case she fell, but also turned the muffin tin over for something different. I scattered the objects over the tin. Obviously this is very different visually but also a whole different way of playing with the tin, no longer are their spaces for things to fall in but spaces for objects to move around. 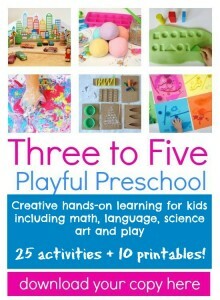 So wonderful for fine motor development. Pictures paint a thousand words and this one just about sums it up. 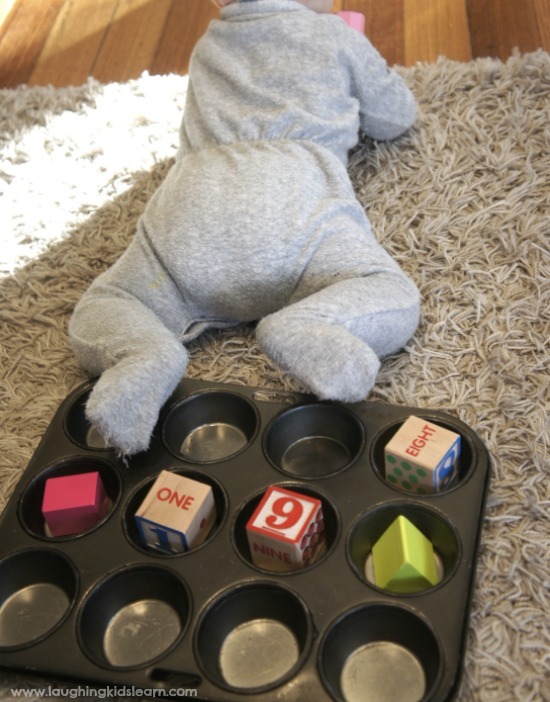 Boo spent such a long time playing with the objects on the muffin tin, however I prepared it for her. 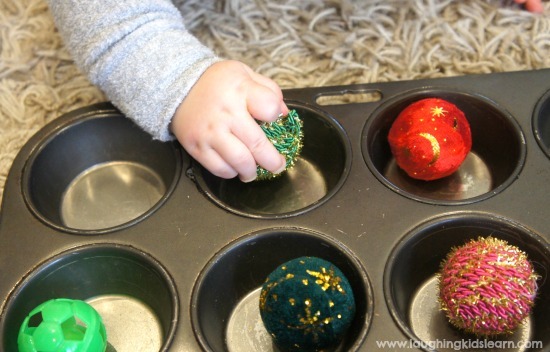 She particularly loved moving the objects into the muffin tin spaces and shaking the balls with the bells in them. Another thing I love about this activity is that siblings can get involved too and it becomes this lovely bonding experience. Possum couldn’t resist also playing with the objects on the tray and it was something that delighted her little sister. It gave us an opportunity to talk about sharing and having fun together. 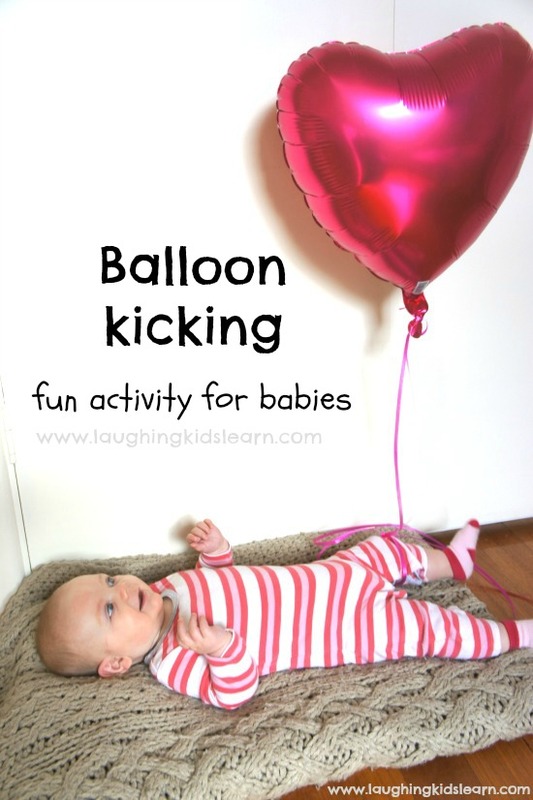 Would your baby enjoy this activity? 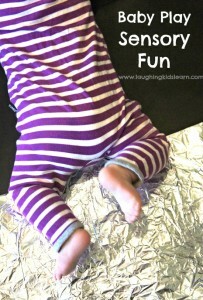 What a fun little activity, and perfect for tummy time! 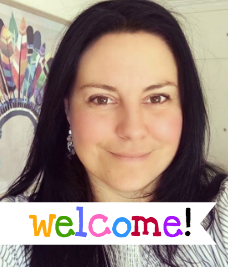 I would like to feature your activity in a list we have on ADAM & Mila with tummy time activities and milestones. I just want to check with you first since I would be grabbing a picture from your page with the link. I won’t copy the content, just link to you with a picture, please drop me a line if it is ok to use your picture. Yes, I approve. Thank you for asking.